Every year on March 14 we celebrate the Pi Day, pi, not pie. Google commemorates the 30th anniversary of this mathematically inspired holiday with a unique Doodle. Pi, is denoted by the Greek letter “π”. One of the oldest and the most recognizable mathematical constant in the world, Pi (π) is the ratio of any circle’s circumference to its diameter. Its value is approximately equal to 3.14159265. It is an irrational number, which means it cannot be expressed as a ratio of whole numbers, and its decimal representation never ends or repeats. Pi, 3.14 is a part of daily life, not just once a year on the fourteenth of March. Obviously pi is of greater relevance to architects, craftsmen, mathematicians. Understanding pi is part of how globes are constructed especially large floor globes like this one. There are so many options for learning about geography and mathematics with globes. 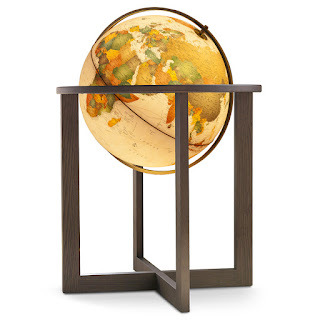 The San Marino is a beautiful, classic globe that would be a welcome addition to any home, office, or study. A deep, brown wooden stand contains a 20-inch illuminated sphere. There are over 1000 geopolitical descriptions and boundaries. A few less common cartographic features such as old ship routes are included, this is visible when the internal LED is turned on. 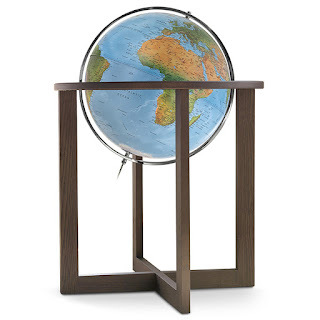 The multi-directional full meridian is constructed from metal and is connected to a wooden ring at the top which allows for complete navigation of the globe. The cord is located between the globe and meridian at the south pole an inline switch is included. Overall assembled size is 38.6"h x 28.3"w x 28.3"d and ships in 2 boxes. Some assembly required. And understanding of pi, was integrated into the human record by various civilizations around 2550 BC. The Great Pyramid at Giza, was built during this time frame, this structure had a perimeter of 1760 cubits and a height of 280 cubits. The ratio of this grand edifice is just about 2 times pi. The earliest written references to pi date back to 1900 BC. The Babylonians and Egyptian estimated the value of pi to be 3.125. Mathematicians adopted the symbol π for the expression in the 18th century: Welsh mathematics teacher William Jones is often credited with the first use of the symbol in 1706. A common, fun ritual is to memorize multiple digits of this mathematical concept. A general awareness of pi has been a component of human knowledge for several millennia. The renowned physicist Larry Shaw initiated this celebration on March 14, 1988. Pi Day received official recognition from Congress in 2009. This holiday has been a catalyst for all sorts of unusual and quirky events. The late Albert Einstein was born on March 14, some individuals chose to dress up in an outfit imitating him. The San Francisco Exploratorium offers various mathematically inspired events. The Massachusetts Institute of Technology releases its undergraduate admissions decisions on Pi Day. This year NASA provided mathematical geniuses with the opportunity to compete in a "Pi in the Sky" challenge complete a set of interplanetary equations.